Want to get outdoors? Here are our top 10 picks for the best parks in Queens. There are hundreds of green spaces to choose from in the borough, but these are best via size, quality, and variety of activities. They'll bring you everywhere from the shores of the Atlantic Ocean to the inside of Arthur Ashe Stadium, and give you a chance to run, sail, hit a wicket, bike, swim, and more. Got questions about parks in Queens? The NYC Parks Department's website lists most park events and locations. Flushing Meadows Corona Park is both the largest and most varied park in the borough and the most visited in New York City. The range of activities is ridiculous: several museums, a theater, a zoo, the Mets, the US Open, fields for soccer, cricket, baseball, and softball, multiple playgrounds, boating on a lake or the Sound via its marina, artwork and an ancient pillar from the Worlds Fair, and room to roam under the gleam of the Unisphere. 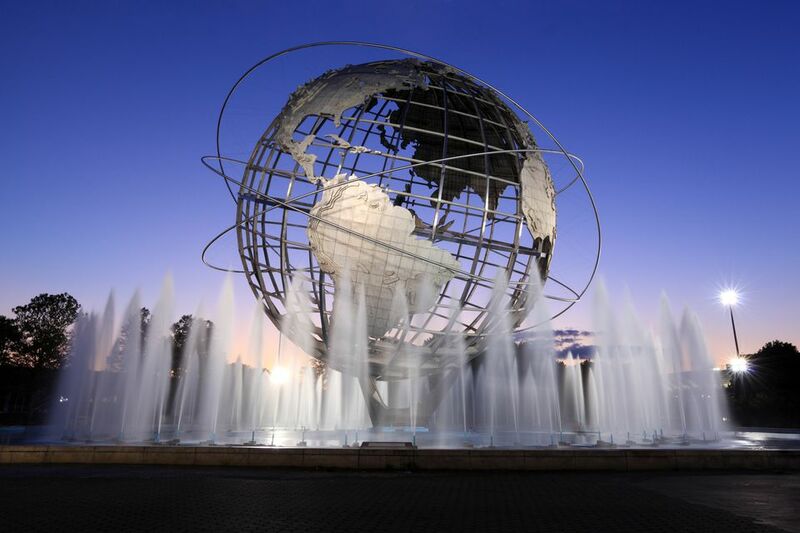 Though the two Worlds Fair towers are dilapidated, and litter and graffiti can be a problem, Flushing Meadows is still the heart of the borough, its most popular green space. There's nothing like strolling under the oak and pine trees in the eastern part of Forest Park, next to Kew Gardens. Partly designed by Frederick Law Olmsted, Forest Park is a must see. And locals know the summer concert series at the band shell is a must hear, while city golfers consider golf course a must putt. Roy Wilkins Park is neighborhood favorite in St. Albans and South Jamaica any day of the year with its extensive basketball, tennis, and handball courts, plus its recreation center and pool. But it's one weekend every summer that really brings a splash to the park. It's the site of Irie Jamboree, the annual reggae festival on Labor Day Weekend with top performers coming from Jamaica. The park is also home to the highly-regarded Black Spectrum Theatre, and an outdoor African-American Hall of Fame. You may remember the immense pool at Astoria Park, but don't miss out on walking along the Park's East River pathways. Gorgeous views of Manhattan and the overhead Hells Gate and Triborough Bridges will be your reward. You'll also find playgrounds, tennis courts, athletic fields -- and delicious Greek dinner at nearby Agnanti. The fourth-largest park in Queens, Cunningham stretches itself this way and that up Francis Lewis Boulevard and a bit along Union Turnpike in Fresh Meadows and Hollis Hills. It's a fine place for a hike or picnic and heavily used for its sporting fields. Every summer the Big Apple Circus visits the park, as does the New York Philharmonic. Kissena is a gem of a local park in Flushing. It's bigger than a neighborhood spot, but nothing too immense. The park's lake has been cleaned up and walk around its shores will reward you with a breeze in the summer. Plenty of folks comes for tennis, bocce, softball, cricket, and, most exciting, the bike racing at the Kissena Park Velodrome. So big, it's really too much to describe, the Gateway National Park stretches along the southern shore of Queens through Jamaica Bay and the Rockaways over to Brooklyn and Staten Island. Don't miss bird-watching at the Jamaica Bay Wildlife Refuge, or the long, wonderful sand and sun of the Breezy Point beaches, or the history at Fort Tilden. Smack on the Long Island City waterfront, the Gantry is small but great. It's the best park in Queens to watch the Fourth of July fireworks show. Juniper Valley Park in Middle Village is one of the best-maintained large neighborhood parks in Queens. There are 55 acres of baseball and soccer fields, a track, a roller-hockey rink, playgrounds, and courts for tennis, handball, and bocce. Come by any day, even a cold Monday morning in October, to see how bocce is played by the pros. Or come in September for the annual NYC Bocce Tournament. Is that it? Nope, far from it. There are hundreds of parks in Queens, many quite small. You can find a list of all the parks in Queens at NYC Parks' website.